2017 Home Design In Review: ‘Farm Meets City Sleek’ Kitchen Design – Design Your Lifestyle. December 2017 December 2017 Peter Salerno, Inc.
2017 was, in the eyes of many, a transcendent year for kitchen design. 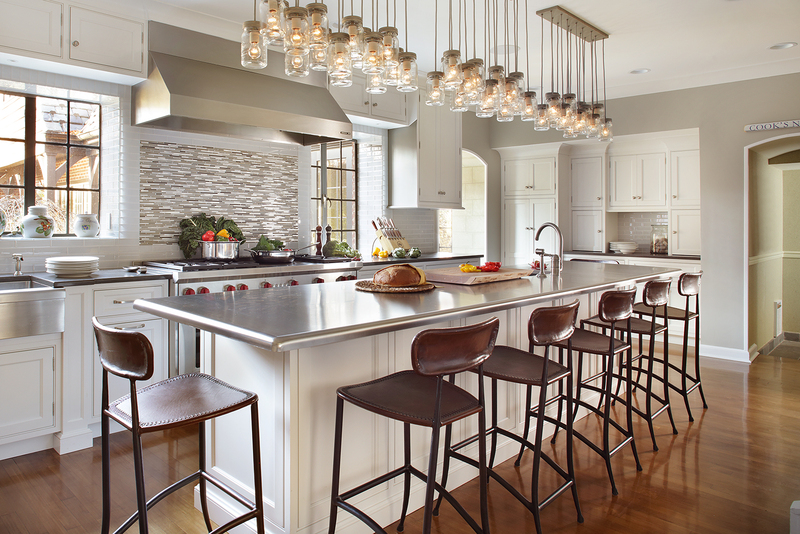 From the rise of neutrals as primary design colors to the addition of traditional design elements to transitional home design, the world’s leading kitchen designers flashed their creativity and prowess throughout the year. The resulting kitchen designs in 2017 were some of our favorites in years. With 2018 around the corner, it’s an ideal time to look back at some of our favorite kitchen designs (and home designs in general) from 2017. Our first stop is “Farm Meets City Sleek”, a tremendous kitchen design from Peter Salerno Inc., the most award-winning North American custom kitchen and bath design firm of the 21st century (and our parent company). From the stellar use of white and brown neutrals to the statement island lighting, the custom range hood to the world-class appliances, “Farm Meets City Sleek” is one of our favorite kitchen designs of 2017. Take a look at the design photos, specifications and review, and see for yourself! 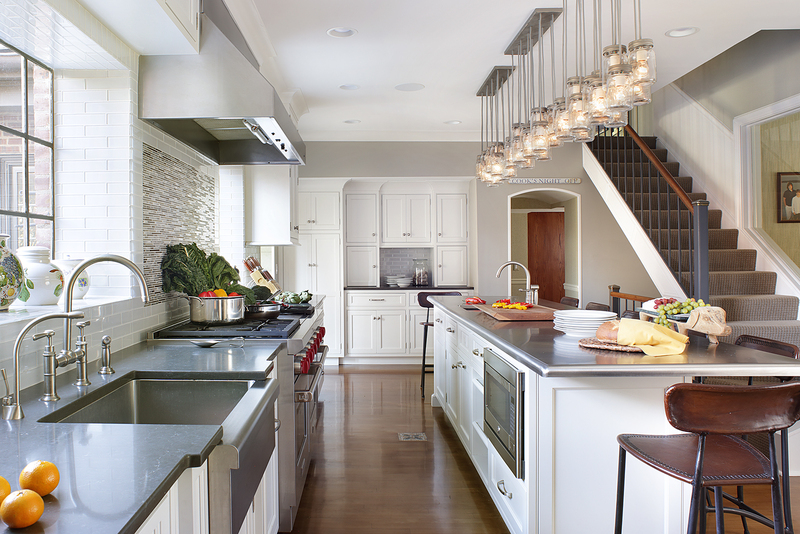 One’s first glance at this transitional kitchen design is bathed in white and ambient light, a nod to the recent kitchen design trend where whites and neutrals are used as the primary focus of the overall color design scheme. From the custom Maestro Rosolino cabinetry (a trademark of Peter Salerno Inc. design) to the kitchen island base, this kitchen is adorned with white. Notes of gray and neutral complement the design, through the custom range hood and counter to the island countertop and wood flooring. One of our favorite aspects of this kitchen design is the 2×8 mixed metal and glass mosaic backsplash over the range, created by the team at Stratta, the Tile Boutique. The appliance features are a mix of the finest names in kitchen appliance furnishings: Miele, Sub-Zero and Wolf. 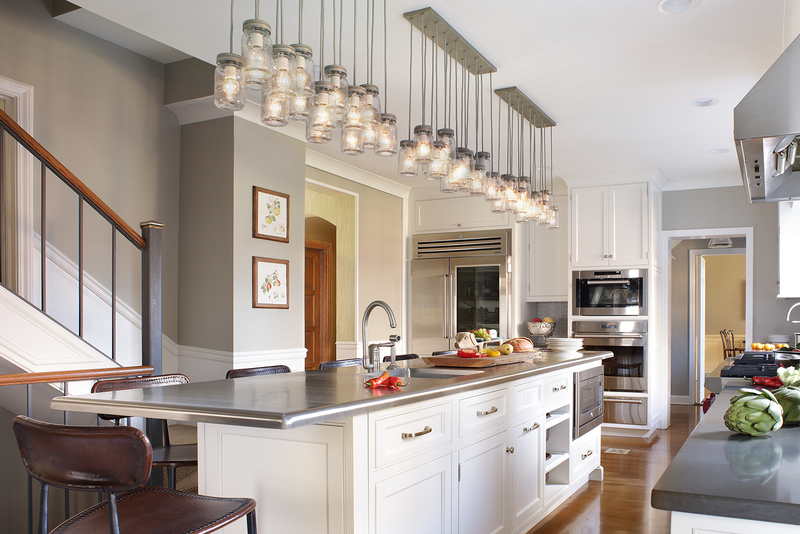 We also adore the statement island lighting, a series of Exter 16-Jar Pendants from Pottery Barn. As an added bonus to the homeowners, that gorgeous wood flooring is actually the existing floor in the kitchen. This Peter Salerno Inc. transitional kitchen design is reminiscent of upscale “farm to table” dining, with a touch of countryside charm melded into a truly modern kitchen design. We hope you love it as much as we do! Questions/comments about this transitional kitchen design or its creator? Fill out the comment form below! Pingback: 2017 Home Design In Review: “Angles in the Details” Kitchen Design – Design Your Lifestyle.